At least a few readers should have seen this by now. 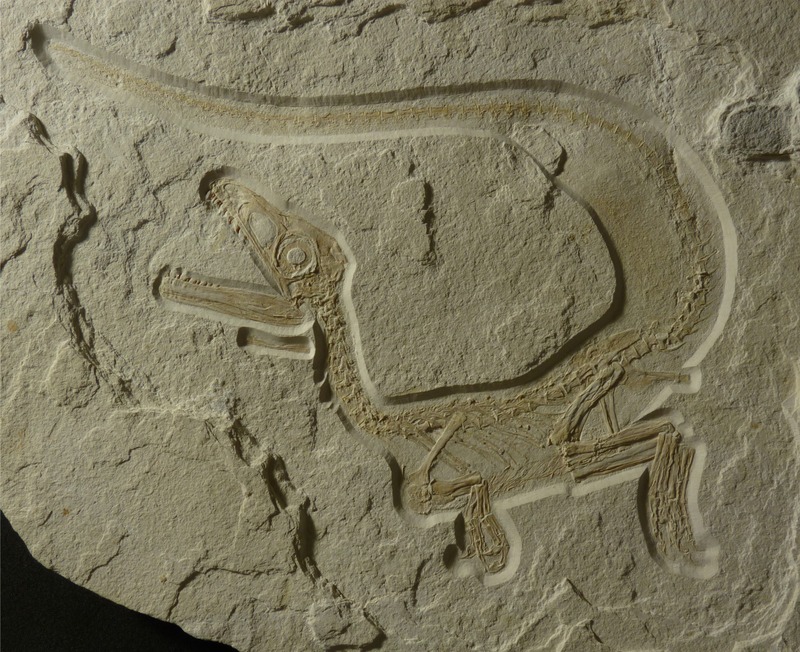 It’s a new theropod fossil from the Solnhofen of Germany and inevitably features some champion UV work by Helmut Tischlinger (who provided these photos). It’s odd to be putting this up when the paper describing this critter is not even out yet, but these photos are on a number of blogs and all over the German press so I don’t feel that I’m really doing the authors a disservice (and indeed I have permission to post them). So enjoy the beauty of this animal and keep a look out for the publication. This is great! Thanks for posting the photo. Can’t wait to find out how she’s described – she looks so complete it’s amazing. Wonder what that odd bone up by her lower jaw is? Those are the hyoids, they help support the tongue. They rarely turn up but do occasionally appear in nice specimens like this. What a spectacular fossil! The skull appears to be rather large relative to the body (based only on my mental image of theropod specimens I’ve seen). The UV image is remarkable too. Is the mineralization aragonite? No idea bout the mineralisation, but yeah the head does look big. I think it’s a juvenile (well, non adult) as the pelvis doesn’t look fused and note do a few neurocentral arches, though it’s hard to see. Holy Anurognathus! What a find this was! Oh so pretty indeed. Surely, guessing by the way the rock is so cleanly edged, there were skin impressions on this? And also, do you know the species? Well the orange patch at the based on the tail in the UV photo looks like preserved skin. But the clean edge around the fossil is down to the preparation work, it’s not natural. Magnificent. What’s the thinking on why even small theropods possess gastralia but all but the earliest ornithischians seem not to? Simplistically, you’d think that if they provided some sort of evolutionary advantage (say, protection or muscular support) that that would also be an advantage for at least the bipedal ornithischians. Perhaps the different hip structure was a determining factor? Very nice. It definitely looks young. When the paper is published, we’ll know the name of this animal, right? This little guy is currently referred to as “Otto.” Whether, it gets a name or not remains to be seen. 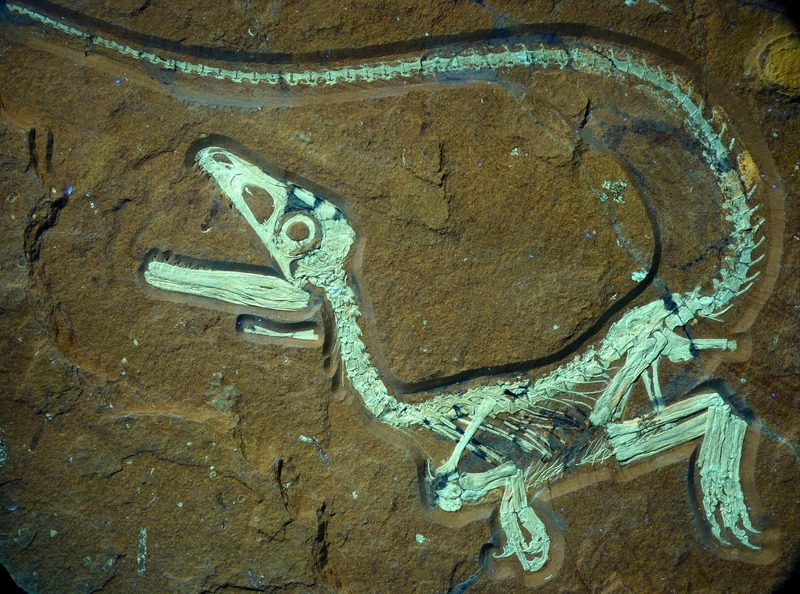 Since it is a juvenile it is likely to place more basal than it might actually be (ontogeny discombobulates phylogeny and all), which could make actual phylogenetic placement pretty uncertain (see all the hubbub regarding juvenile dinos and phylogeny in tyrannosaurs lately), which could result in this guy simply getting a specimen name and “cute” nickname for the foreseeable future. Taxonomically that is probably the safest way to go. Well that really depends on how plastic the ontogenetic characters are and quite how young the specimen. Plenty of characters don’t change during ontogeny (or not much) and of course close to adult they should change little, so it’s entirely practical and reasonable to name things in those circumstances. I don’t know what the authors intend but from what I can see and what I know, I’d imagine it will be named. As I’ve said on the DML, it looks basically identical to Juravenator to me, though both are juveniles of course. 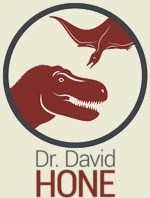 Apparently the authors find both it and Juravenator to be megalosauroids (as reported at the Latin American Congress of Vertebrate Paleontology), which I’ll be interested to read about since they don’t seem that basal to me. But Rauhut does good phylogenetic work, so I suppose we’ll see. So good it looks fake! You are not the only person to suggest that……but even Archie was accused of being a fabrication and when stuff turns up at Solnhofen it often looks too good to be true so let us know if you hear anything useful. Dave – you say from ‘the Solnhofen’. Its not actually from the Solnhofen Limestone – nor from the Solnhofen Basin for that matter. I’m sure you know this, but don’t want to confuse people ! Actually didn’t John. I know there’s a whole mess of fossil beds and layers in the basin that are often lumped under the term ‘Solnhofen’ (just as happens with the ‘Jehol’ in China) but I really did think this was a Solnhofen specimen. If not, where is it from? It’s from the upper Kimmeridgian beds from one of the plattenkalk basins to the east. The press are saying ‘Kelheim’ – it’s certainly in that general area. Ah right, that is news to me, thanks John. So that means it’s earlier! In a way it’s a shame it’s not Solnhofen as it would add so much to that story – but actually its equally exciting in all ways! Can’t wait to find out more! That is an incredible find. The tail looks longer and fatter than that of Juravenator to me. Although that may just be the angle.